TORONTO, June 19, 2013 /CNW Telbec/ - A sustainable process for recycling cigarette waste has long been overdue. This is the belief that inspired TerraCycle and Imperial Tobacco Canada to partner in 2012 in an innovative program to recycle the butts, inner foil, outer wrap, unused tobacco, ashes and other elements that comprise cigarette waste - the most littered item in Canada and worldwide. As a result close to 50,000 people and more than one hundred organizations have banded together to recycle more than five million cigarette filters in the first year of the program. Today, TerraCycle released information on support from Imperial Tobacco Canada and Terracycle's plans for 2013, which includes the goal of surpassing the milestone of 10 million filters collected and recycled. 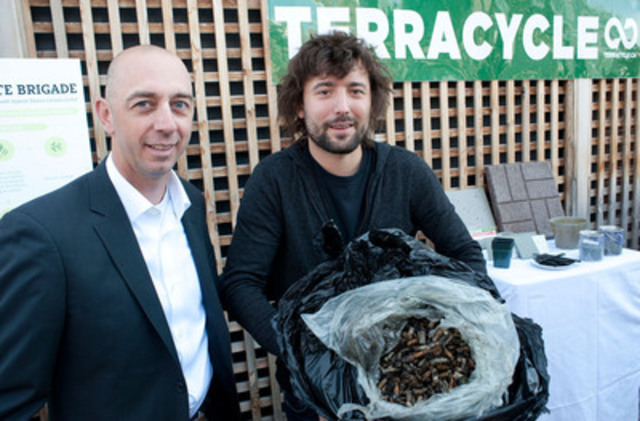 "Several years ago, in the spirit of our vision of eliminating the very idea of garbage, we set our sights on tackling cigarette waste," says Tom Szaky, the Toronto-native entrepreneur who launched TerraCycle in 2001. "Cigarettes butts are one of the planet's most ubiquitous waste streams. We are delighted that Imperial Tobacco Canada and its employees shared our dream to provide Canadians with an alternative to cigarette waste. With such a successful first year under our belts, we're urging all Canadians to consider joining us in 2013." Called the Cigarette Waste Brigade, this environmental program goes well beyond basic recycling; it also incentivizes Canadians by offering money for each pound of cigarette waste collected that can be directed to registered charities, and by making plastic products from the collected tobacco-related waste. Cigarette filters and packaging are recycled into various plastic products for industrial use such as plastic pallets while the ash, leftover paper and tobacco are composted according to industry guidelines. The profits from the sale of the plastic products are then re-invested into the social enterprise, allowing it to grow its national and international programs. The company's revenues are expected to reach $18 million in 2013. By making plastic products from recycled cigarette waste, the program not only reduces the amount of litter in Canada, but also reduces the need to employ wood or virgin plastic in the production of common industrial pallets. "We're committed to working with consumers, employees and our partners to forge a tobacco industry that continually improves its performance in the area of corporate social responsibility," says Marie Polet, CEO and President at Imperial Tobacco Canada. "We are honoured and privileged to support the Cigarette Waste Brigade program." All smokers above the age of 19 as well as offices or organizations can participate in the program by visiting www.terracycle.ca. Collectors are asked to deposit the waste in any plastic bag - which will also be recycled - and to gather the bags into a cardboard box. Once enough waste is collected, collectors log into their account and print a free prepaid UPS shipping label to return their box or boxes of cigarette waste at no cost to them. The participant's account will be credited with 100 points (equal to $1) per pound of waste received. The points can be used to purchase charity gifts or converted to cash for donation to a charity or non-profit of the collector's choice. TerraCycle accepts every element of cigarette waste except the cardboard outer box, which can be readily recyclable by all municipal programs in Canada. Cigarette filters represented the single largest category of litter collected during the 2012 edition of The Great CanadianShoreline Cleanup. To date, TerraCycle's recycling programs have raised more than seven million dollars to charities around the world. Imperial Tobacco Canada is Canada's leading tobacco company, employing nearly 600 people across the country in regional sales offices and at its Montreal head office. Imperial Tobacco is a member of the British American Tobacco Group - a leading tobacco company employing more than 55,000 people worldwide with over 200 brands sold in 180 countries.